Cooking with color is very important to me! Not only is it visually pleasing, it's also a great way to be sure you are eating healthy, nutritious food. When you think about it, carbs and sugars are usually white, brown, or beige. Vegetables and fruits, however, come in a vibrant array of colors! One of my favorite things to eat right now is a simple radicchio and avocado salad with Marcona almonds. Not only does it look beautiful on the plate, it's also wildly tasty and very easy to prepare. Radicchio is in the chicory family and is an excellent antioxidant, great source of B-complex vitamins, vitamin K, and a decent amount of minerals like manganese, copper, iron, zinc, and potassium. The bitter flavor paired with a lemon vinaigrette and the buttery avocado and Marcona almonds make this salad my go-to side dish for any protein. Directions: Whisk ingredients for dressing together. 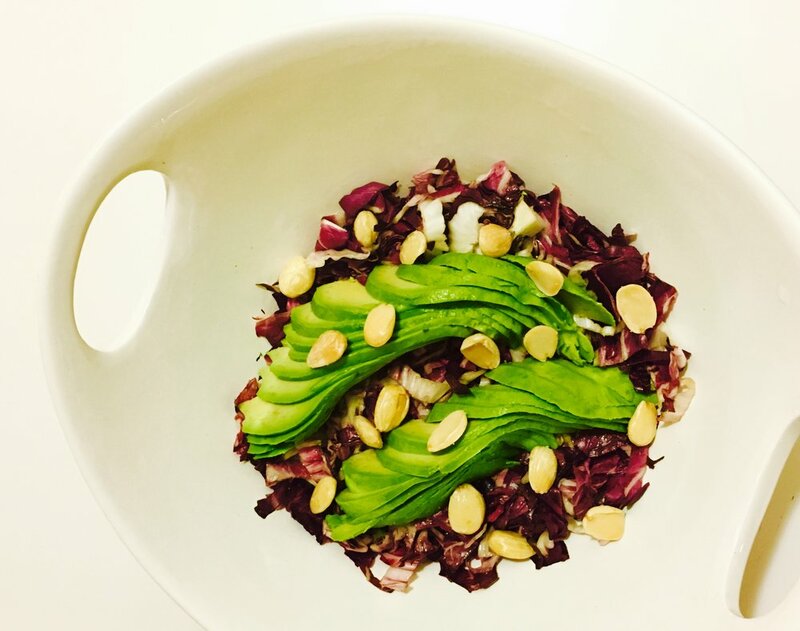 In a large bowl, toss radicchio in dressing top with avocado and almonds. Enjoy!